A major work at the time it was made, this had taken me almost six months to complete (athough not continuous work). The idea was proposed by James Allen, and he also provided the character being dressed up to impress. Although I usually do not like to mix focco with unrelated content, this idea seemed neat: kind of an ambassador or the like, getting dressed in the Procyonian fashion and not being at all that comfortable with its “revealing” style. 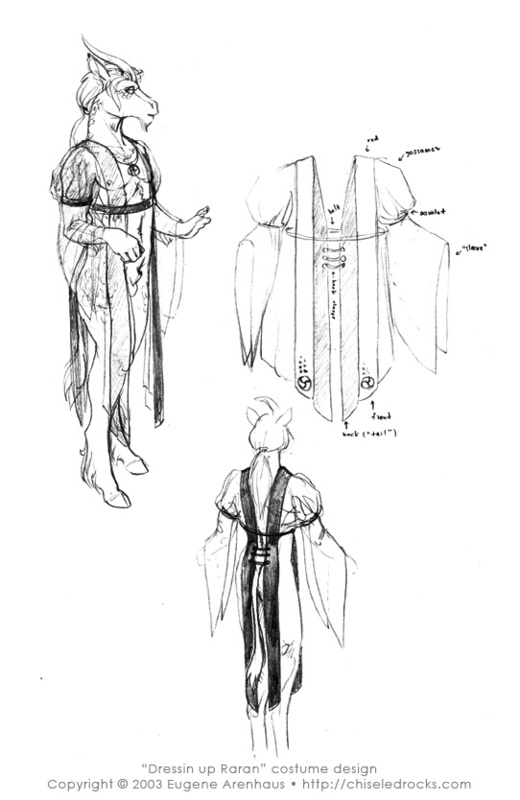 But there are many more things I still like in it; there was challenging lighting, and the mirror (which had been very difficult), and the parquette floor, and a chance to design more pretty costumes. It may be a little outdated compared to my current skill, but it still stands. And I had used the techniques I developed for it in other paintings. And yes, this costume is actually two pieces. It is held together by chains around the waist and arms, and the back parts are prevented from getting displaced with some clasps. Otherwise, it leaves the back and front bare. The figure in the back wears a less elaborate version of it, actually. Nicely done, dude... very nice.